tags: A "Western" that's different! Following a killing and robbery in a big city back east, gang leader Kedge Darvas and some of his henchies take a train to a small western town in Idaho, with intentions of hiding out there until things cool down back in Chi or NYC, or wherever they lammed from.They are welcomed with open arms by the citizens under the impression they are there as capital investors with money to spend. Before long, Darvas figures the town is ripe for the taking and sends word for reinforcements, and each arriving train unloads a few suits and snappy-brim hats.Then they get rough, kill Sheriff Posey Meed and rile up the citizens, led by cowhand Brad Farley, who had Darvas spotted for a wrong number just by the way he made moves on Sue Vancey. One of a group of novelty Westerns that sought to link the Western with the Gangster genre. Subtlety, showing to movie going folks, in the depths of the depression, that old fashioned ways were the best. 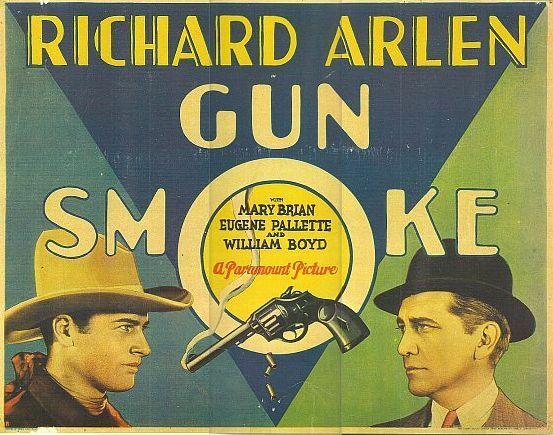 Even in 1931, Westerns were still finding their "talkie" feet and a lot were big on talk and short on action ("The Painted Desert" (1930), "The Apache Kid's Escape" (1930)) - action was one thing "Gun Smoke" had plenty of. Kedge Darvis (the always excellent William "Stage" Boyd) is crowned "king of the underworld" after a slew of vicious killings. He and his gang (including J. Carroll Naish) decide to hide out in Bunsen, Idaho where they think they will be able to live un-noticed. However, they are given a red carpet welcome. In the middle of all this, Brad Farley and his sidekick Stub Wallack (Richard Arlen and Eugene Palette) ride into town, whooping and hollering. Brad is suspicious of Darvis and his plans and gives vent to his feelings about how city people come to the West to improve conditions - usually to the detriment of the West. Brad's main problem is Sue Vancey (Mary Brian) who has suddenly gone quite cold on him since Kedge Darvis' arrival. (Heaven knows why, as there's no comparison between Richard Arlen and William "Stage" Boyd). She is dazzled by Darvis' big city ways and thinks Brad should buckle down and get a man's job (as if roping and rounding up horses isn't a man's job!!!) but he is suspicious of these "city slickers". "Darvis plays the gentleman for a week", so the title goes - there are a lot of linking titles, a holdover from silent days but unusual for 1931, I would have thought. Suddenly Strike finds gold on Sue's property and the gangsters show their true colours - from this point it is all go!!! When Strike goes for the sheriff he is shot in the back and the gangsters take over Bunsen, even killing the Sheriff. Brad Farley is up in the hills, hunting mustangs and is oblivious to the fact that the gangsters are holed up in Vancey's ranch and have cut it off from the world. Tack Gillup (Charles Winniger) escapes with the help of a Chinaman (Willie Fong) and gets word to Brad, about "killers, the kind you and I have ever heard of"!!! When the gangsters realise Tack has gone they "head for the hills" taking Sue and Hampsey Dell (Louise Fazenda) hostages. When Brad returns the killing starts!!! Arlen shows why he was a movie Western hero with some terrific stunt work and pretty fancy riding - all without losing his hat!!! There is a rock slide, a horse stampede - there is a thrilling fight on the edge of the cliff between Brad and Darvis - only one survives!!! Funny how when Brad finishes his fight he is only a bit dusty but when he comes over the cliff he is tattered and torn. I think I will remember "Gun Smoke" for Arlen's impassioned speech where he beseeches the town's folk to remember when America was big, clean and roomy. Mary Brian didn't have much to do but sigh and pout prettily but she was always nice to have around. Anne Shirley (she was Dawn O'Day back then) plays the grocer's daughter and has a funny scene where she is supposed to present the "respectable businessmen" with some flowers (pansys) but can't remember her little speech. Recommended. To my great surprise, IMDb has only one previous review (by "kidboots") for this great little western gem, even though it was formerly available worldwide on an excellent USA VintageFilmBuff DVD (coupled with "The Secret Call", which also starred Richard Arlen). I heartily agree with everything "Kidboots" has to say. "Gun Smoke" is a smoothly produced and meaty little western with plenty of location action (in fact some censors might say, "too much action!") and excellent performances from both heroes (led by Richard Arlen and Eugene Palette) and villains (led by William "Stage" Boyd, who makes the most of this showy and meaty role). Speaking of meat, you must see Eugene Palette on horseback! That sight alone would surely have aroused the fans and made this movie super-popular! And last bot least, our heroine is the very appealing Mary Nolan (although true to the traditions of most Hollywood westerns, she has little to do but look beautiful and get herself caught by the bad guys, so that our hero can race to her rescue). Yes, all the usual western ingredients are here, including great on- location photography by Archie J. Stout.